Just something I've been thinking about for a while now and haven't seen any other topics about it. At Anime Matsuri 2016, Christian Tremblay explained how the concept for SWAT Kats Revolution is that continuing from the original show, over the years, the equipment, gear and arsenal the SWAT Kats have been using eventually became outdated/obsolete until the point they could not compete with the various villains anymore. And that it would only be with the help of this newly introduced hacker character that they are able to revamp/update their equipment to go head to head with the bad guys again. While I'm happy they didn't choose a reboot like many studios do these days, I'm real curious: are they gonna show in what aspect did their stuff become obsolete? Like, is the Turbokat not fast enough anymore? Can't turn/maneuver quickly enough? Their radar can't pick up villains because they have some jamming/cloaking device? The villains got their hand on some super hard material/alloy the SWAT Kats missiles can't penetrate? So I'm real curious what exactly this 'SWAT Kats became obsolete' story will consist of. Will it tell a convincing story that, yes, the SWAT Kats really do need new gear and not just feel like it's new gear for the sake of having new gear for the new show. And to see how exactly will the new gear differ from the old. Especially since those gadgets and weapons were a pretty important, integral and memorable part of the entire show (in my opinion anyway). Tech changes over time, and what was once revolutionary can now seem quaint or old-fashioned, and not everyone can keep up. If the SWAT Kats get most of their gear from junked military-grade salvage, it's possible that the government started using different disposal sites. This would effectively cut the SWAT Kats off from their supply of stuff to refurbish, preventing them from accessing junked military assets utilizing post-1990s technology, and a finite amount of even that, to boot. This is one reason I can think of for why the SWAT Kats might end up behind the times, technology-wise. They could raid the other disposal sites, of course, but I doubt they could do it often enough to properly keep up, or even steal enough of anything to have a steady supply train. Another explanation is that as we get older, it becomes harder to adapt to new trends and technologies, and the SWAT Kats age like anyone else do. So a younger individual from a more recent generation (i.e., this "hacker" character) could serve to help acclimate them to the new stuff. Everyone is capable of learning, but not every can self-teach; the SWAT Kats might be presented in Revolution as old dogs--I mean kats needing to be taught new tricks, with their new ally as their teacher. I just hope the hacker isn't some insufferable stereotype (like a goth chick), and doesn't speak in modern lingo, as that'll immediately date Revolution in a way the old show wasn't (which might be one of the reasons for its longevity; other than the music, it isn't "very 90s" in any obvious way like its contemporaries). Of course, I worry she might have to if the Tremblays want to appeal to a younger audience... even though the main reason to make this show at all isn't to show it to a new generation of viewers (although that'd be great! ), but to appeal to adult fans who grew up with the original, specifically the ones who've kept it alive all these years and funded the Kickstarter. Ergo, we won't need modern "sick" modern slang all that much. Sounds cool, hope to see Revolution at some point the Swat Kats are always welcome around here. Hope all is well! I personally hope they're not planning to have such a big gap. I don't really want a Batman Beyond setting with SWAT Kats, lol. If that banner they had at Anime Matsuri is representative of what they want Razor and T-Bone to look in the new series, they're not planning to have that long of a time elapsed. Lance Falk also said he would find it funny if the first episode of Revolution started with a "5 years later" text, tho he might have just said a random number which is not in line with the Tremblays' idea. I hate to be a naysayer, but I really don't like the idea of the hacker character. I rarely like the 'hollywood hacker' characters who have superhuman mental capacity with deep knowledge of every system in existence. By donning the hacker hoodie, you too can conjure up magical technologies and break existing ones with a few keystrokes in a psuedo-unix terminal! Seriously, these characters are rarely ever done well as far as I'm concerned and they're just used to break out of corners that the show gets written into. 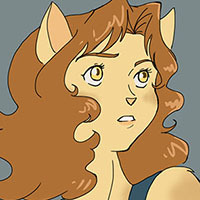 On top of that, it sounds like they want to have this character effectively be a 3rd swat kat? That would throw off the dynamic of the already established characters. I could see it if it was like some side character they want to have helping them out or something. It seems like adding a 3rd character is something you'd want to do to change things up a bit 5 seasons in, not right out of the gate with a revival. The show has a nostalgia factor going for it. New characters would diminish that. At the very least it's a pretty big risk to take when reviving an old show. Yeah, I have my doubts about that character as well, for the same reasons you explained. One of the big appeal of the show (for me anyway) was the dynamic of Jake and Chance, in and out of costume. While having a 3rd character could make for entertaining situations and conversations, having her as a regular character might not be the best idea. I'm afraid I am also one of those people who was skeptical when hearing about both the Swat Kats' need for help in the technical department, and also the introduction of this "hacker" character as a reoccurring third member. Firstly, I don't buy that Jake and Chance can't keep up with technology. Jake especially. I know tech guys. I know older tech guys. They don't stop learning how to do things once they're out of their 20's. Anytime something new comes out: programs, electronics, coding language; they jump right on it and they learn it. They LOVE staying caught up with anything new; they can't wait to play with the newest tech toys. Why would Jake and Chance be any different? They are constantly upgrading their gear. They are always looking for the newest gadget, the newest weapon. Nearly every episode, Jake is just itching to try something new he tinkered with. These guys put together more advanced gear from less advanced parts. They MacGyver the crap out of that scrap on the daily. I don't buy that they get to a point where they aren't coming up with anything new and one day they just wake up and "Oh no! When did the technological world advance without us?" Why can't the show just pick up where it left off? Why can't our heroes still be young and spry and always ahead of government technology? Why would the fans want a show about some older dudes who don't know how to use the new iphone? I really feel like this out-of-character set up is only for the purpose of putting in this hacker Mary Sue character. How many hundreds of fanfics are already out there about the Swat Kats getting themselves a third female member for reasons? I don't mean to be disrespectful to Lance Falk, but this is something he does sometimes. He will change existing characters so he can fit in his own characters. He is still hung up on Cry Turmoil and how he couldn't do the story he wanted about Feral. But there are many fans (myself included) that are happy he did not get his way. The story he wanted was out of character for Feral. It would have completely negated and ignored that iconic and fan-favorite scene in Metal Urgency where we see Feral has a line that he does not cross where criminals are concerned. That scene resonated with me, even as a child. To ignore that just so he can add his own character would have done both Feral's character and the show a disservice. Choosing to do Cry Turmoil a different way was the right call. I just wish the episode was longer. The Swat Kats don't need this "hacker" character. The show doesn't need it. T-bone and Razor's dynamic doesn't need a third character of any type. Want to bring in a hacker character for an episode and do like a... trapped/fighting in a VR world episode that shows like to do in attempt to make the show feel more "modern"? Go ahead. Don't add a third Swat Kat. It's not necessary. The funniest thing about this is that in the attempt to be more modern with a "hacker" character, they are introducing a plot point that is so grossly 90's in nature it made me cringe. The movie Hackers came out in 1995. It is now 2018 (almost 2019), you can now be a white hat hacker legally and professionally. This is an actual JOB you can have now. Hacking is not a new, modern thing anymore. Also, once again, I vote no for a reoccurring third Swat Kat member of any gender. I just want my Jake and Chance bromance in their garage bachelor pad/secret super hero base. Please don't take that away from me.